Chilled beam system is a type of HVAC system that delivers energy efficient operation along with enhanced occupant thermal comfort and good indoor air quality. The chilled beam system uses water as a medium of cooling and heating indoor space through a process called convection. Warm chilled water is supplied to the chilled beams and the indoor induced air which passes through the chilled beams, gets cooled and descends to the space for cooling. This process is continuous and fresh air is also induced to avoid the concerns over ventilation and to prevent condensation over beams to some extent. Sensors are installed over the beam to monitor the room temperature to prevent condensation and dripping into the space. The chilled beam system has a wide range of applications in various industry verticals such as commercial offices, educational institutions, healthcare facilities, hotels, and others due to the increasing focus on energy conservation and enhancing the efficiency of air conditioning systems. The market for chilled beam system is expected to reach $239.9 Million in 2015, reflecting a year-on-year (Y-o-Y) growth rate of about 10.0% over the previous year. Furthermore, the market is expected to grow at a CAGR of 11.14% between 2015 and 2020, to reach $406.8 Million by 2020. The market is expected to be driven by the increasing demand from commercial offices, healthcare facilities, and hotels in addition to the educational institutions till 2020. Although the European market accounts for the maximum market share, the North American and Asia-Pacific markets are expected to witness the highest growth rate during the forecast period. The key drivers of the market is being driven by the demand for improved thermal comfort, indoor air quality, and floor-to-floor space saving along with, the need for energy efficient ventilation and air conditioning systems in several applications. However, the market is restrained by factors including the high cost of ownership and low awareness among the consumers. Currently, Europe accounts for the highest market share, due to the well-established market since the 1970s and increasing adoption rate of chilled beam system solutions in various applications, especially in commercial offices. However, the market is at the nascent stage of growth in other parts of the world including North America, Asia-Pacific, and RoW. North America is expected to witness the highest growth during the forecast period, driven by the rising awareness about the benefits of chilled beam systems and escalating demand from commercial offices, healthcare facilities, and hotels sectors. This report covers the market by design, function, application and geography. It also provides a detailed analysis of the current market situation and the market till 2020. The report also analyses the supply-side and demand-side factors, market dynamics, and the value chain of the chilled beam system market by considering the key stakeholders from vendors to end-users. This report profiles the major players which are active in the chilled beam system market. It also comprises the competitive landscape of the main players including the key growth strategies and market share analysis of the same. Some of the key players profiled in the report are TROX GmbH (Germany), Halton Group (Finland), Flakt Woods Group (Switzerland), FTF Group (U.S.), Swegon AB (Sweden), Lindab AB (Sweden), Systemair AB (Sweden), Dadanco Pty Ltd. (Australia), Caverion Corporation (Finland), and Titus HVAC (U.S.). This research report categorizes the global chilled beam system market based on design, function, application, and geography; it also covers the market size forecast of the market. The global chilled beam system market has been segmented on the basis of design into active chilled beam, passive chilled beam, and multi-service chilled beam. Based on function, the market has been further segmented into two sub-segments such as cooling only, and cooling and heating. The most widely used function includes cooling and heating. The market has been further split based on application into five sub-segments such as commercial offices, educational institutions, healthcare facilities, hotels, and others. Chilled beam system are of three types which include active, passive, and multi-service chilled beams which are used to constantly provide energy efficient air conditioning and ventilation system to the building in which they are installed. The demand for chilled beam systems has been increasing at a considerable rate with the increasing need for energy conservation in several applications. However, the market faces various challenges due to a complicated trade-off between temperature and latent load (humidity), to prevent condensation over the beams. Moreover, factors such as the high cost of ownership along with the lack of consumer awareness act as restraints towards the growth of the market. 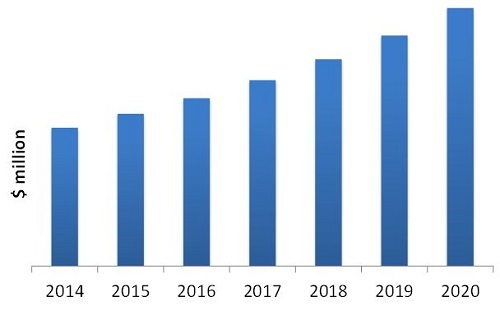 However, the market is expected to grow at an estimated CAGR of 11.14% between 2015 and 2020, driven by the increase in demand for energy saving in buildings and enhanced thermal comfort for occupants, in addition to the increasing benefits of chilled beam systems such as low noise levels, floor-to-floor space savings, and good indoor air quality in various applications. The key market players in the market aim to increase their product offerings and market size in various applications and regions through collaborations, partnerships, new product launches, and by upgrading the existing products. The report covers the market which has been segmented on the basis of design, function, application, and geography. Furthermore, it comprises the analyses of the market dynamics during the forecast period, Porter’s Five Forces analysis, and the current competitive scenario along with the market size analysis of the key players. The report also includes the detailed profiles of the major players in the chilled beam system market along with their growth strategies. This report describes the drivers, restraints, opportunities, and challenges pertaining to the chilled beam system market. Furthermore, it analyses the current market scenario and forecasts the market till 2020, including a market segmentation based on design, function, application, and geography. Different chilled beam systems include active, passive, and multi-service chilled beams. Among these, active chilled beams account for the major share of the market. Moreover, the multi-service chilled beam segment is also expected to grow at a significant CAGR of 13.88% during the forecast period. Europe held the major share of the market in 2014, followed by North America and Asia-Pacific. Some of the major companies included in the report are TROX GmbH (Germany), Halton Group (Finland), Flakt Woods Group (Switzerland), FTF Group (U.S.), Swegon AB (Sweden), Lindab AB (Sweden), Systemair AB (Sweden), Dadanco Pty Ltd. (Australia), Caverion Corporation (Finland), and Titus HVAC (U.S.), and others.